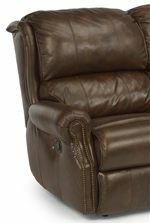 The Latitudes - Comfort Zone group offers a traditional look to comfortable leather reclining furniture. With this selection of a double reclining sofa, double reclining loveseat, and rocking recliner make a great way to entertain friends and relax with family in impressive style. Wing backs and rolled arms with nailhead trim complement the plush cushioning of the Latitudes - Comfort Zone motion group. Browse other items in the Latitudes - Comfort Zone collection from Miskelly Furniture in the Jackson, Pearl, Madison, Ridgeland, Flowood Mississippi area.